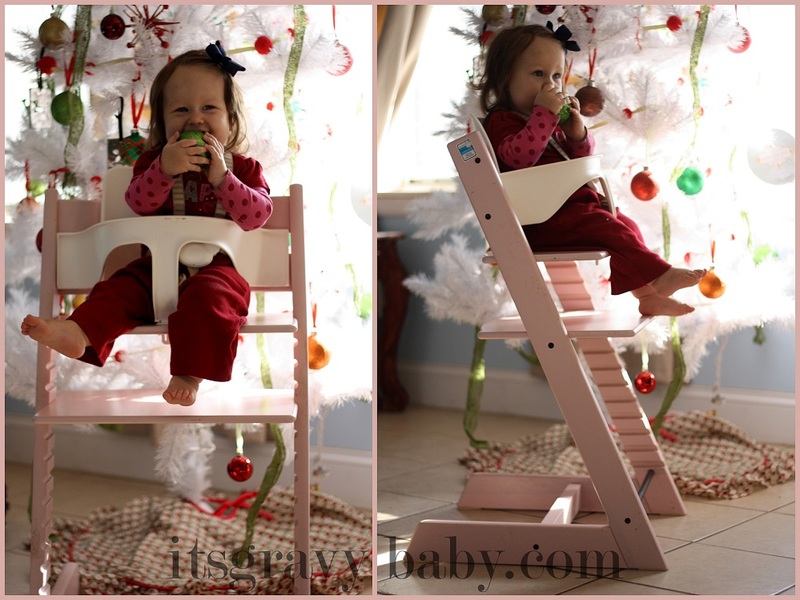 Stokke Tripp Trapp High Chair - Review - It's Gravy, Baby! When it comes to infant products, I try to invest my money wisely. I look for quality products that will last. I research everything before I buy and always try to find the best value. Two things I’m not willing to sacrifice quality on are car seats and high chairs. I’m brand loyal when it comes to both of these products. Our high chair of choice is the Stokke Tripp Trapp. We bought our first Stokke Tripp Trapp when Bryson was a baby and started using it when he was right around one year old. I had never saw one in person until we purchased ours, but I’m so glad that I picked the box up and brought it home. We loved it- we still do. He’s three now and we still use it daily. It has held up to his messes and being pushed around the kitchen to help himself to the cabinets or watch us cook. It’s even held up to me using it a step ladder. It’s in almost constant use and when I take the time to scrub it down, it looks like new. When Bella came along, I planned to move Bryson out of his Tripp Trapp. Then, the time came and I just couldn’t do it. Instead, the kind people at Stokke sent Bella her very own Tripp Trapp in pink! I was so excited for it to arrive and we (meaning Justin, haha) put it together immediately. It isn’t difficult and the instructions are very clear. I think it probably took around 30 minutes and that was with two kids under foot. We are currently using it with the baby seat attachment for added security. We never had one with Bryson and I really like it. I know that the price ($264) seems expensive when you think about a high chair, but the Stokke Tripp Trapp isn’t just a high chair. You’ll never have to get rid of it- it’s a lifetime piece. It gives your children the freedom to sit at the table with the entire family. Bryson has spent hours in his Tripp Trapp at the dining table crafting, creating, and painting. Not to mention, I don’t have a huge piece of plastic sitting in the middle of my floor. This high chair is made of wood and it looks nice. It matches my home and it’s as sturdy as it gets. This little girl? She loves it too! If you have any questions, please feel free to ask and I’ll answer in the comments. Overall, we really, really love this high chair. I can’t think of anything bad to say. The only thing that could make it better is if it cleaned itself. Now, wouldn’t that be something!? The kinds folks at Stokke sent us a Tripp Trapp for Bella. All thoughts and opinions remain my own, as always. Love this! It looks so easy to clean …I may have to save up for this. I love products that grow with our kids! I’ve read several reviews that complained of this chair tipping. Have you had any experience with tipping? I am seriously considering this as a christmas present for my 1 year old. He is quite physically strong and a squirmed. He HATES his space saver seat at the point. We’ve owned a Tripp Trapp for over 2 years now and we’ve never had a tipping incident- not one. Bryson (my 3 year old) was and is a very strong child- physically and willed and he’s never even come close to tipping it over. 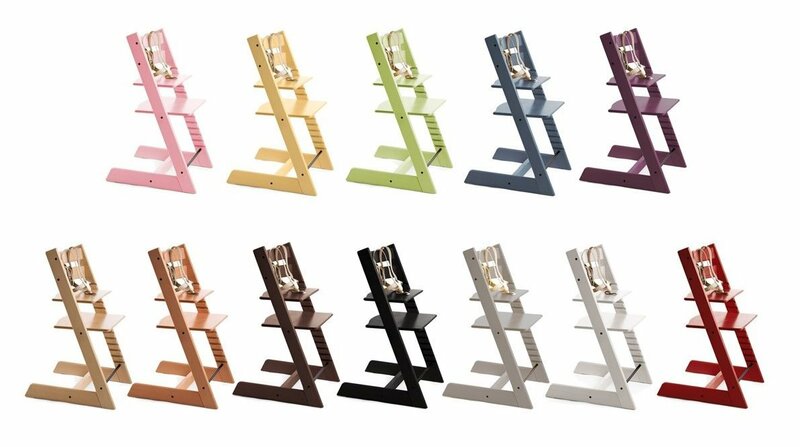 As I mentioned in my review, my husband and I even use the Tripp Trapp as a step stool quite often and I’m not small girl, haha. I hope that helps you in your decision! very cool. and i just want to bite her chubby lil feet! It looks really cool but it is very expensive. Oh my gosh those things are so cool! How awesome that you can keep using it even after she’s done needing a high chair! That chair looks so stylish and with a weight limit up to 300 pounds, such a good investment as well!